Municipalities are responsible for the condition of technical infrastructure installations, shaping the conditions of functioning of companies at the local level. The operation of municipal infrastructure generates costs that need to be financed by budgetary revenue. The aim of this paper is to identify the interdependencies between the level of municipal infrastructure provision and the level of fiscalism in property tax. 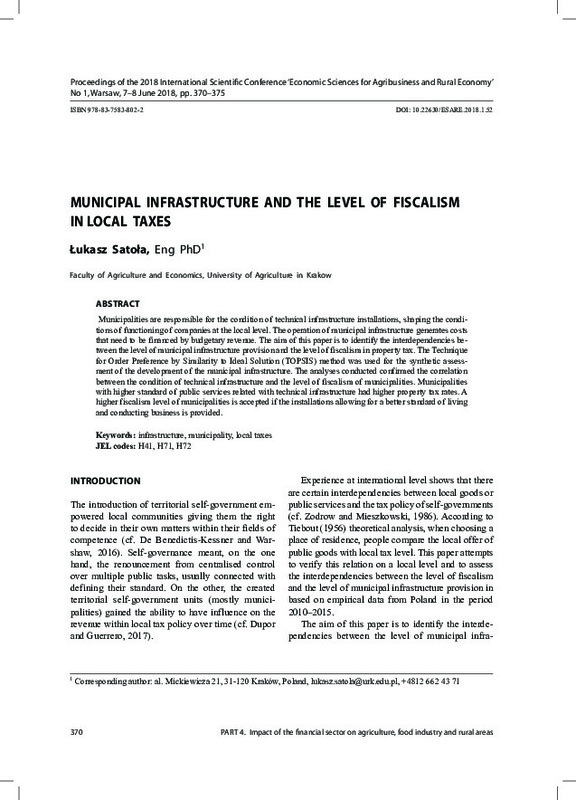 The Technique for Order Preference by Similarity to Ideal Solution (TOPSIS) method was used for the synthetic assessment of the development of the municipal infrastructure. The analyses conducted confirmed the correlation between the condition of technical infrastructure and the level of fiscalism of municipalities. Municipalities with higher standard of public services related with technical infrastructure had higher property tax rates. A higher fiscalism level of municipalities is accepted if the installations allowing for a better standard of living and conducting business is provided.